We have put together a comprehensive range of exhibition furniture to help you take your event display to the next level. 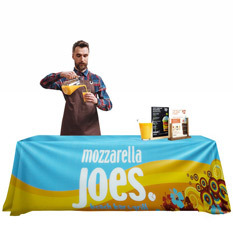 Designed to be easy to transport and assemble, our exhibition displays are ideal for taking to trade shows, in-store promotions or for long-term use in offices, receptions, showrooms and presentation halls. Many of our exhibition and display furniture products can be customised with printed graphics. These are produced in-house using your provided artwork or can be produced by our designers working from your brief. We use the highest quality inks and media to ensure vibrant display furniture graphics get your message noticed. Our selection of portable exhibition furniture products have been put together based on our feedback from exhibitors, retail customers and using our expert knowledge in the industry. 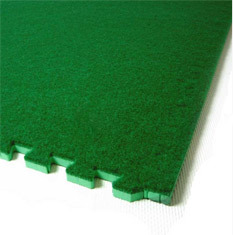 If you can't find the product you are looking for please call us on 0844 800 1020 to speak to one of our display advisors. 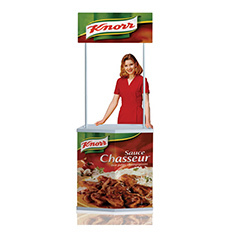 Ideal for in-store promotions, sampling or as part of your trade show display, our promoter counters are available in various designs and sizes, but all consist of a main counter area with an elevated header to display customised branding. The counter usually has a flat, easy to clean surface and storage area in the rear for accessories. As well as the promoter counters, we also have a choice of counters and workstations, which have been used by our clients for presentations, offices, receptions or as part of a trade show stand. 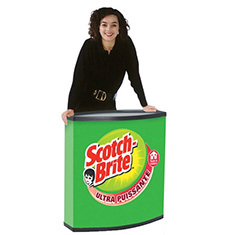 Designed to be portable, many of our counters have options for a custom printed graphic wrap to display your branding. 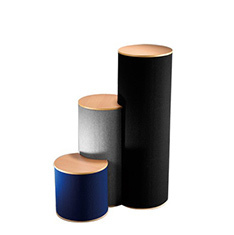 Promotional plinths are great for displaying products throughout retail stores or to showcase products at exhibitions. We have plinths available in various different sizes and colours, with selected products having the option for custom printed graphics. 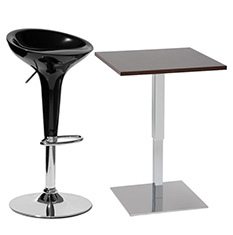 To help make your clients and yourselves comfortable at your promotional event, we have a range of high-quality bar stools, tables and seating as well as custom printed tablecloths in a choice of sizes. 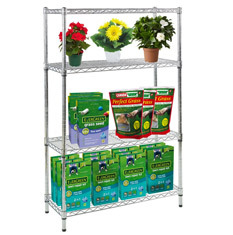 Our shelving can be used for a variety of purposes, aside from storage, we have also seen them be used to great effect to present products as part of a promotional display. 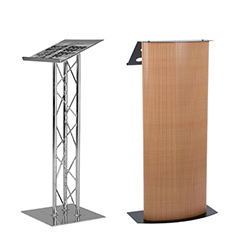 To bring a focal point to your presentation, our lecterns are available in various different materials and designs and many of our lecterns come with the option for a custom printed front graphic. If your event is outside, we also have a wide range of outdoor display furniture products that are designed to withstand inclement weather and be easy to transport. If you are looking for a backdrop to compliment your exhibition furniture, check out our range of exhibition stands to take your event to the next level. 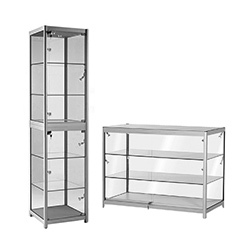 Discount Displays for display Furniture - exhibition furniture for trade show displays plinths, counters tables promoter units.